The RootsMagic mobile app is "Read Only" This means that you cannot add, change, or edit the information from the RootsMagic app on your mobile device. Changes can only be made from the RootsMagic program on your computer first, and then uploaded to your RootsMagic mobile app via Dropbox. From your mobile device click on the app store icon. For android devices it will be your Google Play Store icon, and for iPhone, or iPad it will be the blue icon with the letter "A" in the center of the circle. Then search for the RootsMagic app and download it to your mobile device. Note: If you already have a Dropbox account skip section B and move to section C and proceed with the instructions. On the main Dropbox website screen click on the “Get Dropbox Basic” icon. On the "Create an Account" screen you will need to enter your name, email address, and you will need to create a password for your Dropbox account. Then click on the blue “Create An Account” button. Congratulations, you have now successfully created your free Dropbox account!! Now that you have successfully created your free Dropbox account you are now ready to sync your RootsMagic mobile app to your Dropbox account. 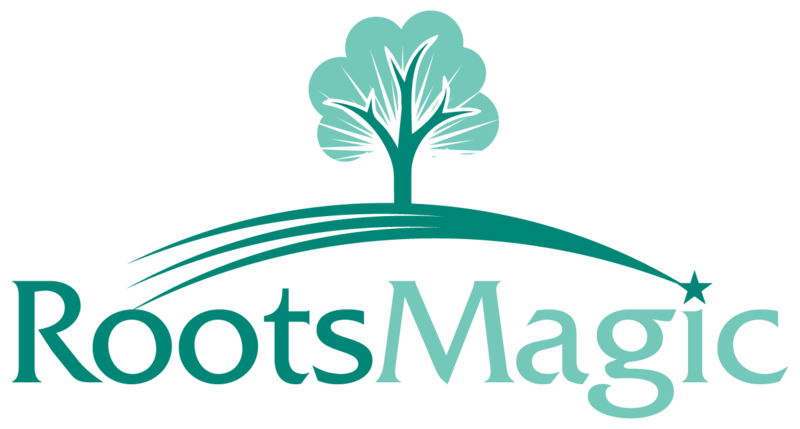 Open your mobile device and look for the RootsMagic App icon. Tap on the RootsMagic icon from your device screen to open the app. At the bottom of the RootsMagic app screen tap on the “Files” menu and select Dropbox. In the Link Dropbox screen click on the “Ok” button to link your RootsMagic app to your Dropbox account. From the Dropbox sign in screen you will need to enter your username and password for your Dropbox account. When prompted, click on the blue “Sign In” button at the bottom of the screen. Click on the blue “Allow” button to give RootsMagic permission to access your Dropbox account. From your computer double click on the RootsMagic icon. Click on the file menu (upper left corner of your RootsMagic screen) and select “Save To Dropbox for Apps” from the drop down menu. In the RootsMagic Authorize screen you will need to enter your email address and password for your Dropbox account. Then click on the blue “Allow” button to allow RootsMagic to access to your Dropbox account. After clicking on the blue Allow button, a copy of your RootsMagic data will be saved to the RootsMagic folder inside your Dropbox account. Open your Safari web browser and go to dropbox.com and sign into your Dropbox account. When you are signed into Dropbox click on the Files Menu on the left side of the screen. Click on the Apps Folder. Click on the RootsMagic sub folder and leave that screen open. On your Mac computer click on your Finder icon from the Dock at the bottom of your computer screen. From the menu located on the left side of your finder screen click on the Documents folder. When you get into your documents folder look for your RootsMagic file. The file will have the name that you gave it, and the extension of .RMGC on the end. When you see the file, drag and drop a copy of the file into the RootsMagic folder on the Dropbox screen. Tap on the Files Menu at the bottom of your RootsMagic App screen. In the Dropbox screen towards the top you will see your file. Tap on the name of the file.